SEASON ONE, EPISODE THREE- "HAWK-EYE"
For the last two weeks, I have felt that "Minority Report" the TV show would be tough thing to keep reporting back to every week. I think there are some great cop shows on TV, some mediocre shows and some bad shows. But one thing is for sure, there are way too many cop shows on television. But I guess in some ways, that's a good thing. What draws us to cop shows? Why do they matter so much to us? I think its because cops are heroes, and we genuinely love watching good people succeed. I am especially shocked in a good way that these shows do so well in a country where a healthy portion mistrusts our men and women in blue. The thing with "Minority Report" is that its a cop show with a gimmick. Throwing a gimmick into the mix doesn't automatically make the show better. Especially when the show just goes through the motions, instead of thinking outside the box. 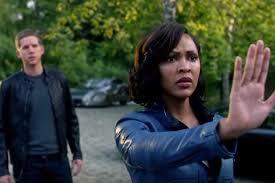 For the passed two weeks, that's all "Minority Report" has become, an ordinary cop show with a gimmick. The story shifted slightly this week, and there are some threads being pulled that could break the show from the mold its falling into, and I am eagerly hoping that it does. The show introduced the Hawk-Eye program this week. Its a program pretty similar to Precrime from the 2002 movie, which maybe a letdown to some of you. But basically its an algorithm that reads your past and present criminal records, blood pressure, where you are and what your doing, so on and so forth. Basically this program is keeping a close on eye on you at all times, and if it finds a reason to arrest you, it alerts the authorities. Yes, there are some similarities to Precrime, but if handled correctly, that could payoff in the show in a big way. There was a character tonight that mentioned living in a police state, and paralleling our current situations, that could really hit home in several viewers as well as bring some credibility to the show. We will just have to wait and see. There is also something going on Agatha (Lauren Reagan), she isn't the same solemn, innocent-looking woman she was in the movie. There is something much different about her, and while I find it wildly out of character to what she was in the movie, perhaps it could lend to some story threads that might be halfway interesting. It seems she is up to something illegal, with a man played by William Mapother (who ironically also starred in the 2002 movie, but I don't know if this is supposed to be the same character). She also warns her brothers of an impending doom surrounding the police department. She thinks that Dash's new partner will betray him, Dash doesn't want to believe it, but its no secret that she has her other brother spooked. This could also lead to some interesting stories that could also break the mold the show is in. This all wrapped around another detective story where the good guys easily win in the end. While the cop with the gimmick aspect of the show is stale, there are some stories that I think should be fleshed out a bit. They could make the show interesting and stand on its own. What did everyone else think?